During the oil and gas boom of the 1880s and 1890s, the glass industry was drawn to Blackford County, Indiana. The industry used arsenic and lead in manufacturing the glass, and since there were no regulations about handling hazardous materials at the time, they could have left behind contaminated soil. Arsenic is a carcinogen. Arsenic and lead are neurotoxins. They do not break down over time. Blackford County Concerned Citizens in partnership with the Hoosier Environmental Council tested soil at some of the glass factory sites. The sampling and lab analysis were generously donated by EnviroForensics and Envision Laboratories. Click here to see a 4-minute video about the project. The results for Montpelier are in the table available here. The Montpelier samples had the same levels of arsenic and lead as soil generally does in this part of Indiana. A single sample from the dirt parking area had an arsenic level slightly above background, but well within the recreational field standard. All of the results for Hartford City are in the table available here. 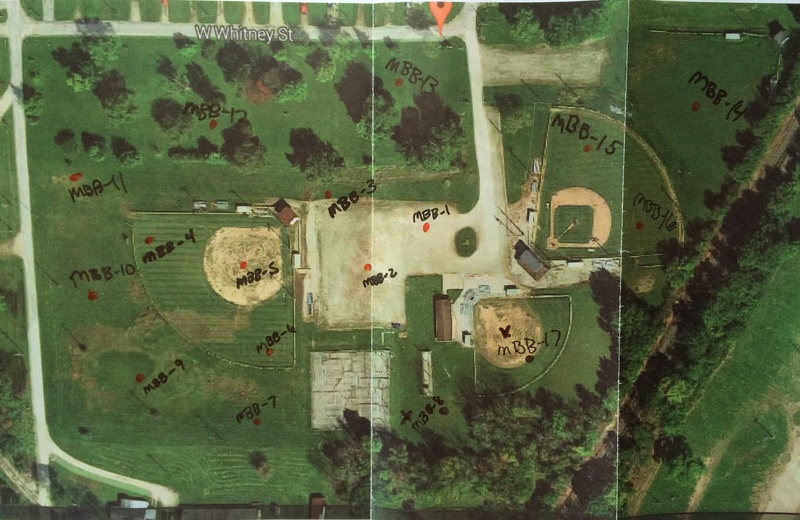 The samples from the grounds at Southside Elementary are SE-5 and SE-9 through SE-15, the rest are from around the Babe Ruth baseball field. 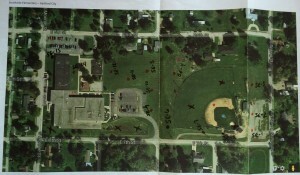 All of the samples taken on the grounds of Southside Elementary had arsenic and lead levels within the range expected in Indiana soil. Some of the deeper soil samples have higher concentrations, but people are not likely to be exposed to that soil unless it is disturbed. 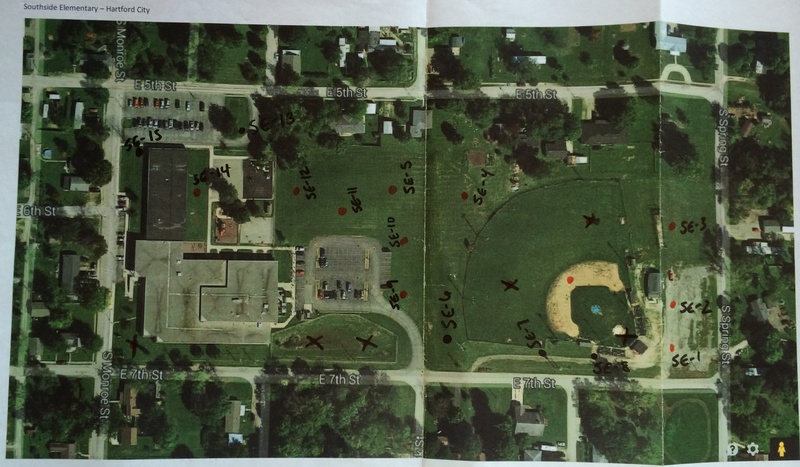 At SE-7 and SE-8 along 7th street the soils 0.5 – 2.0 feet deep have arsenic concentrations as high as 42 mg/kg. The sample with the highest surface arsenic (SE-4), also has an arsenic concentration of 36 mg/kg at 0.5 – 1.0 feet deep. These are also above Indiana’s residential standard but well within the standard for recreational fields (IDEM, 2015). An elevated concentration of lead was found in one sample, SE-4, at 0.5 – 1.0 feet deep. It had a concentration of 446 mg/kg which is higher than the residential standard of 400, but lower than Indiana’s recreational field standard, which is 800 mg/kg. lead 8.2 – 78.5 mg/kg . The arsenic and lead found at this site are high enough that they were most likely left behind by the glass factory. 1. Avoid soil exposure. While the site is safe for recreational use, it never hurts to reduce exposure to soil containing lead and arsenic. These precautions have the added benefit of reducing exposure to any lawn chemicals that might be used at the site. 2. Keep the soil planted. Plants, including grass, hold soil in place and reduce the chance that people will be exposed to soil contaminants. 3. Remediate the soil if the property use changes. There are a total of five sample locations around the Hartford City baseball field where the arsenic concentration exceeds the Indiana standard for residential properties and one that exceeds the residential standard for lead. These arsenic and lead concentrations would need to be addressed before the property could be used for housing. Arsenic in soil is taken up by certain types of plants, so this property should not be used for growing food until the soil has been remediated.